Say “hi” back! I promise I’ll read every comment to him. 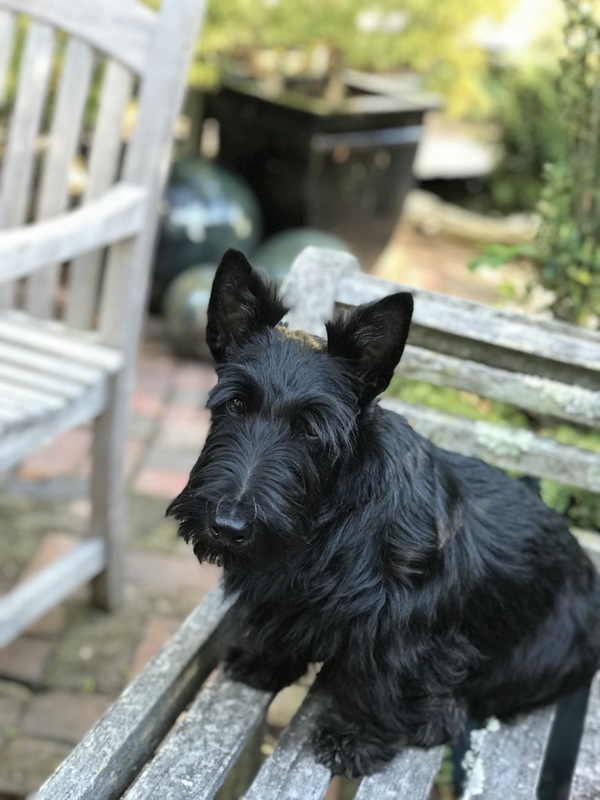 This entry was posted in The Scottie Chronicles and tagged dog photography, dog photos, dogs, dogs with blogs, pets, photography, puppies, Scottie dogs, Scottie pictures, Terriers. Bookmark the permalink. Well done on the Scottie held tilt. It’s the secret way to extra treats! Hello Winston…you look very studious setting there. ♪ ArOoOo ♪ Cutie pie ! Hi Winston!! You are so cute!! You look just like Jessie. I guess all black Scotties look alike. Love you sweetheart!! Welcome..,you are such a lucky boy…you have hit the jackpot in Scottie homes and pawrents. Fiona, my Scottie girl and I look forward to reading a lot about you! HI sweet Winston. I’m sitting here wearing my Stuart shirt. You have big paws to fill. Hi from Connecticut Winston! You sure are a handsome boy and we’re looking forward to following you through all your adventures! Hey there, sweet pup! Time to play!!! Hi Winston….from your older and wiser buddy Saxby. Hi Winston! You look very serious! Hi Winston…welcome to the Pack. Can’t wait to hear all about your Scottie ways! Hi, Winston, from Molly Mia in Ontario, Canada. You are absolutely adorable! Have you learned to ArroOOOO yet? Those eyes are milking it for all its worth………but you don’t fool us! Hi Winston!! Okays…Wilson, how goes it? I am glads you found your peeps, and I am sure you will train them well. Be patient ~ it can take a while, and some peeps are slower than others (my Ma won’t read this, rights?) . If you needs any tips, stop by my bloggie, and I can gives you some pointers! Hi Winston! You’re such a handsome li’l pup! Hi Winston! It’s like I am looking in a mirror seeing your adorable face. My name is Finley, and I am about 2 weeks older than you and look just like you! What fun we will have growing up! We are lucky pups to have found the peeps we have! The Bruce says he thinks they may be related judging from the expression in his eyes. They seem to have those chocolate covered cherry eyes you just can’t resist. Winston! Welcome! All of us at Modern Scottie Dog, especially our Winston, think you are the best little Scottie puppy! Oh my Winston, you are one handsome young man! HI! Winston! What a handsome boy your are! Skye and I say a friendly hello to Winston!! We are so happy he is part of our large family of caring people. Hi, Winston! Sounds like your settling in just fine. Happy walks and sniffs! Hello sweet Winston! I haven’t been on for a while and just now learned about you. I’m just so excited for your peeps and you. You lucked out sweet boy as far as peeps go you know!! I can’t wait to read and see all your antics. I too know how quickly we forget all the puppy stuff – we lost our baby in August of 2016 and decided to get an Airedale in Oct. 2016! O. M. G.! I thought I was too old for that stuff! Fast forward one year and all is well. We relearn all that stuff well! So, what I’m saying is hang in there Winston with the peeps – it’s a learning process of everyone involved! You are just way too adorable!!! So nice to hear from you! Thanks for stopping by. And condogulations about your Airedale! !